"TEN GRAND® is a game of action! " A game can be won on one turn of the dice! 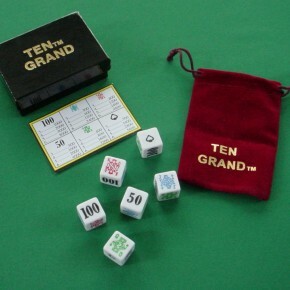 The TEN GRAND® dice game includes 6 dice, handy carrying pouch, instructions, score card and gift box. 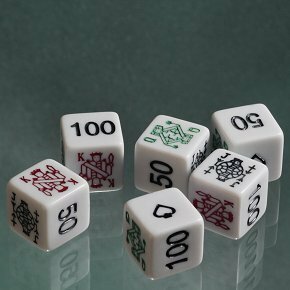 The six dice, each have an Ace of Spades, a King, a Queen, a Jack, the number 50, and the number 100. TEN GRAND® is a geometric progression of 2, dice game. Geometric progression of 2 refers to the way 4 of a kind are worth twice as much as 3 of a kind are worth and so on. 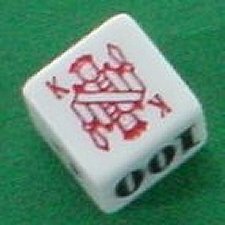 The Basics: There are six dice, each with an Ace of Spades, a King, a Queen, a Jack, the number 50, and the number 100. 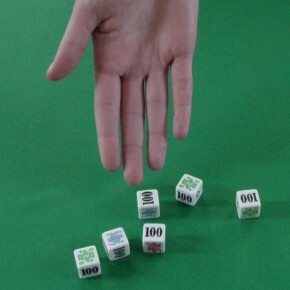 Each player takes TURNS, ROLLing the dice to try and score points. You add together points from each TURN to try and reach 10,000 points but the first player to reach 10,000 does not necessarily win. TURNS consist of ROLLs of the dice, starting with all 6 dice. TEN GRAND® is a game of action! With each throw of the dice, you risk more and more points, and the key is knowing when to say, “I’ll STOP.” Throwing big points on a turn is exciting! 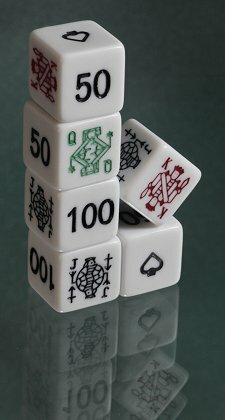 The dice are cool and its fun for all ages. The game can be played almost anywhere. We accept most major credit cards, checks and money orders.